GM: After coming around the corner you see the passageway extends thirty feet to the north, then turns west. Mapper: Do you mean the turn happens after thirty feet of straight passageway, or does the thirty feet include the turn? GM: It is thirty feet to the northern wall. Mapper: Does that include the square I’m standing in? Or is the total length of passageway forty feet? Mapper: (Holding up map) Is this right? This is unpleasant for a variety of reasons. At the surface, it eats up play time, and focuses too much of that time on interaction between the DM and a single player. Worse still, it’s not even particularly fun play for either the DM or that one player. There’s a communication break down in the above that goes beyond simple difficulty describing the length of a passageway, and can quickly lead to frustration on both sides of the screen. 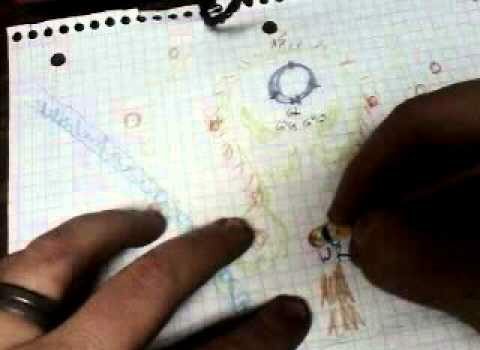 The DM is often working from a map with very explicit dimensions — usually graph paper with ten foot squares. Ultimately though the he doesn’t really want this level of precision when describing the environment to the players. It breaks immersion, moving the group away from feeling like they’re standing in a spooky underground tunnel and towards the awareness of sitting around a table drawing on paper. The characters are surely not carrying tape measures around the dungeon precisely measuring the length of every hallway. Are we playing dungeons and dragons or construction sites and quantity surveyors? The player though is just trying to play the game well. If this is a game about exploration, then keeping an accurate map is a key tactic for success. A good map is an important tool for making decisions on where to explore next, or to form theories about where hidden areas may exist. Play without any mapping is just as difficult, if not more so, as the players become unable to make any kind of informed decision on where to explore and decline into frustration or boredom. What we are left with is directly opposing goals. The DM is enticed into using less specific language to heighten immersion while the players demand more specific language for tactical success. How do we play in a way that both sides find engaging? There are also ways to shift the scales in the other direction, though strangely I’ve only seen them as player initiated. For example, I’ve seen players make higher level conceptual maps without graph paper that simply define locations, connections, and decision points. These maps don’t distinguish between a short straight passage and a long curving one if there are no branches or doors along them. They simply show a short line connecting room A to room B. While this method is faster, cuts down confused language, and increases immersion, it also sacrifices some of the tactical use of maps. They won’t, for example, be as good at revealing potential locations of secret doors. Also, as I’ve said, I’ve only seen this approach taken as a short-cut on the player’s side. Would players accept a DM-mandate of this kind of practice? It’s hard to imagine players not balking at a “no graph paper, unlined paper maps only” rule. I suppose we could try starting from a source map without explicit scales or measurements. Has anyone ever tried this? It sounds terrifying to me but I’m kind of curious. Does anyone have any other ideas? I started writing this in hopes that like many topics by describing the problem I’d arrive at a solution, or at least some ideas to lead me towards one. That didn’t quite seem to materials though. Perhaps if I sleep on it I’ll come to something. Or maybe one of my clever readers has some good ideas? It’s a skill that you can learn, on both sides of the table. After a while you get “good enough” to not screw yourself most of the time. Yeah, I just hate having to re-invent the wheel with each individual player. There must be a better way. I’m not sure how a scale-free map would help. There are plenty of times – lighting distance, spell effect sizes, duration of spells and light sources – that depend on the GM (at least) knowing the distances involved. No explicit measurements means you’ll need to make those measurements during play instead of when you’re doing game prep. For some GMs perhaps that’s easy. For me, it’s not, so I make everything as precise as it can be on my own map. My approach is that as the GM I give rough map distances (“you go maybe 8-10 years or so, and enter a room wider than it is deep – maybe 10 yards by half that”). I will give precise measures if people stop to measure precisely or have a way to measure precisely on the fly. My map has an accurate scale, the PCs have a map that’s close but not always exact. But I deliberately make “exploration” not a code word for “discover hidden areas by mapping to the foot.” Close enough – even a rough idea – is good enough. My PCs recently solved a go-and-return puzzle problem using a map that was wildly inaccurate in scale but measured connections well enough to get around. They’ve found new areas by noticing areas they never finished exploring. But they don’t need to know to the square what my map looks like because that isn’t a requirement. I also refuse to look at their map except when I’m unable to describe something – even then, I’ll draw it on a piece of paper or lay it out with miniatures and wall segments on the table and let them draw it. That works. The tricky bit for me is common language to describe relative direction, since I don’t give compass map directions. You make an excellent point regarding needing to know actual distances for adjudicating rules. Light sources, spell ranges, etc, etc. I think as DM it’ll be pretty hard to get away from needing to know exactly how far the players are from any given feature. You’re describing exactly what I put forth as the typical DM approach — to be intentionally vague in the language. And yes, eventually any given player will figure out how much detail you will or won’t give, and you’ll develop a rapport, and it will become less painful – but never completely painless. I still feel like there must be a better way. Perhaps there isn’t, but I’ll keep looking. It’s a typical approach, but I think the a-stereotypical part is that I don’t expect precision from the players. They don’t need precision, merely being good enough is good enough. And they determine what that is – if it bothers them enough to spend time on precision, fine. We’ll do that. If you don’t, we don’t. As long as we both know the goal of play isn’t for them to turn my imprecise descriptions into a precise copy of my map, we’re all good. My preference is for players to make low-detail maps. I’ve had players find potentially unexplored/inaccessible areas that way. Then they say there going to look at the bordering areas again to confirm that potential. But, since I have some players who really need visual aids, I’ve been experimenting with using something like Encounter Elements, Blue Dungeon Tiles, Dungeon Forge Game Tiles, etc. to assemble a rough outline of the area the PCs can see. As they move, I disassemble what they can no longer see to build what has come into view. It isn’t so much for moving minis around as simply communicating the shape of the space. This has actually reminded me to make sure email sending from the new site works correctly. It wasn’t, but it should be working now, so hopefully you’ll get an email from this comment. As a GM, I’ve frequently drawn a close to scale map for my players. (None of them care much about mapping, but like an idea of where they have been.) Occasionally, because of terrain or in a maze-like area I’ve only offered description and no map. As a player, my character usually has a basic skill in cartography and I draw a very simple map of lines and squares that gives a layout, but certainly isn’t to scale. For both situations, myself and the other GM use a lot of floor-plans (some purchased tiles, etc; a lot of varied passages and rooms I’ve made/cut out on light card) with miniatures for some exploration and most combats. A lot seems to hinge on secret areas here.